The following books are facsimile reprints printed on heavy acid free 8.5" x 11.5" paper and are spiral bound with cardstock covers. In the reprinting process some photo quality is lost. Since these books are printed on demand please allow a week for shipment. 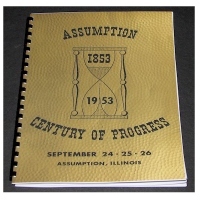 Assumption Century of Progress 1853-1953, The Historical Committee, 1953, 74 pp, This book contains history, photos, ads of the local businesses with photos, and program of daily events. History of Decatur, Illinois Its Resources, Advantages for Business and Attractions as a Home with a Brief Sketch of Its Manufacturers, Prominent Business and Professional Men and a Complete Classified Business Directory Wiggins & Co., Cleveland OH, 1871, 51 pp,The title is a misnomer, there is not a lot of history (3 pages) in the book. 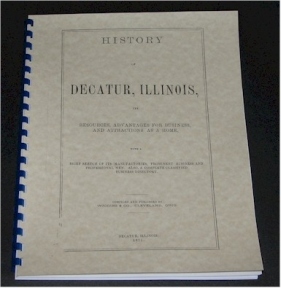 This book was produced to advertised the wonders of Decatur and to attract new citizens & businesses to the town in Macon county in central Illinois. There are sections on Government, Railroads, Agricultural, Commerce, Cheap Homes, Building materials, Water Supply, Gas Supply, Health, Education, Cemeteries, Vineyards, Fair Grounds, Churches,Business Directory, List of Manufactures. DeKalb Centennial 1856-1956	Progress Unlimited The Centennial Committee, 1956,92 pp. 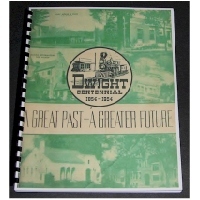 The contents of town Centennial booklets vary from town to town. This one contain schedule of activities, list of membership of numerous committees, history, photos and ads of the local businesses. Dwight Centennial 1854-1954 A Great Past - A Greater Future,The Centennial Committee, 1954, 106 pp, This book contains history, photos and ads of the local businesses. 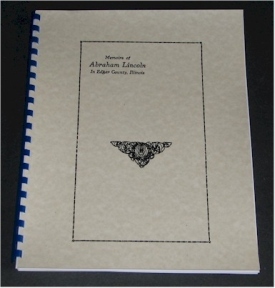 Memoirs of Abraham Lincoln in Edgar County Illinois, The Edgar County Historical Society, 1925, 32 pp,The booklet contains articles on: Marking of the Lincoln Circuit, Circuit Court of Paris May Term 1852 with Lincoln's cases, Letter from A.L. to G.B. Shelledy of Paris, Letter from A.L. to G.W. Rives of Paris, Personal Memory of A.J. Baber, Personal Memory of Howard McCord, Personal Memory of Lucy Lamon, Personal Memory of Belle Pierce, Personal Memory of Wm. B. Sheriff, Personal Memory of W.C. Slemmons, Personal Memory of H.P.H. Bromwell. 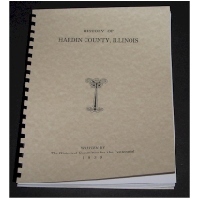 History of Hardin County Illinois, The Historical Committee for the Centennial, 1939, 82 pp, This is a history of the county and talks about the settlement of the county, industry, roads, ferrys, farming and more. There is not an over abundance of buried names. The county is in southeastern Illinois and the county seat is Elizabethtown. Other towns are Cave-In-Rock, Rosiclare, Karbers Ridge and Lamb. 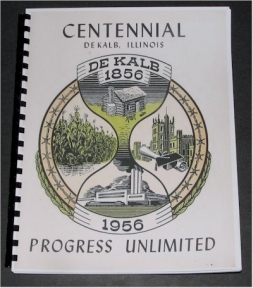 Kankakee Centennial, 1853-1953, The Kankakee Centennial Association, 1953,111 pp. 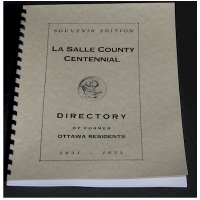 The contents of town Centennial booklets vary from town to town. For a genealogist this is one of the better ones. The book has a history section, program schedule, photos (old & current), and ads. 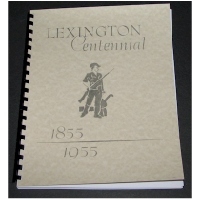 Lexington Centennial 1855-1955,The Centennial Committee, 1955, 74 pp, This book contains history, photos, ads of the local businesses with photos, and program of daily events. 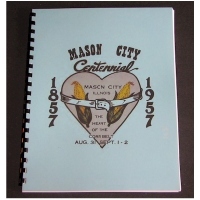 Mason City Centennial 1857-1957, The Centennial Historical Committee, 1957, 80 pp, This book contains a good history section, photos and ads of the local businesses. 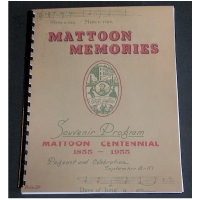 Mattoon Memories Souvenir Program Mattoon Centennial 1855-1955 The Historical Committee, 1955, 91 pp, This book contains, history, a few photos, ads of the local businesses with photos, and program of daily events. LaSalle County Centennial Directory of Former Ottawa Residents 1831-1931 , Daily Republican-Times, Ottawa IL, 1931, 48 pp, This is a list of people that moved away from Ottawa some time prior to 1931. The amount of info provided varies. Some cases it will list spouse, occupation and where they live while others it will state moved to X 5 years ago. 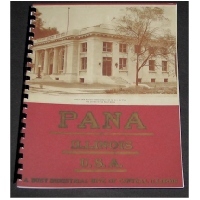 Pana Illinois Some Luminous Phase of Its Every-Day Present Activities and Future Possibilities, James Allen Reid, Pana IL 60 pp, This is a "sales brochure" for Pana (Christian County) to attract new businesses and residents. There are photos on every page showing the great homes, parks, schools, store fronts and more. The text describes the city and the services it has to offer. There are also pages devoted to the following towns, Ohlman, Owaneco, Oconee, Assumption. Of course, there are ads for local businesses. 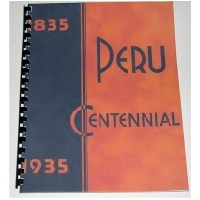 Peru Illinois Centennial Commemorating One Hundred Years of Peru's Existence The Historical Committee, 1935, 63 pp, The book is mostly history with sections on early history, school, churches, clubs and industries. In addition there is a buyer's guide listing the local businesses from 1935. Of course the best feature are the old photos of the town showing homes, businesses, schools, churches fire fighters, trains, riverboat. 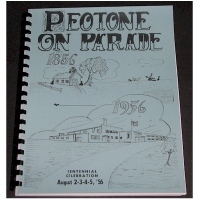 Petone on Parade 1856-1956 Centennial Celebration, The Centennial General Committee, 1956, 94 pp. 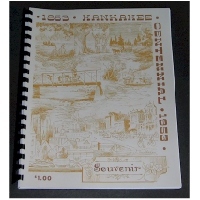 The contents of town Centennial booklets vary from town to town. For a genealogist this is one of the better ones. The book has a history section included list or early settlers & 1878 business directory. You will also find photos old & current, ads and material on organizations. 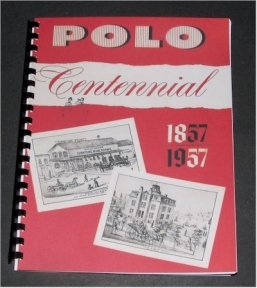 Polo Centennial 1857-1957, The Centennial Committee, 1957, 110 pp, The contents of town Centennial booklets vary from town to town. This one contain schedule of activities, a little history, many photos and ads of the local businesses. 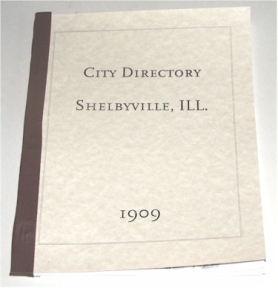 City Directory Shelbyville, IL, 1909, H.E. O'Brien & H.A. Cox, The Union Printers, Shelbyville, 1909, 78 pp, The book contains many ads from businesses and a directory. The directory includes, name, address and occupation in some cases. 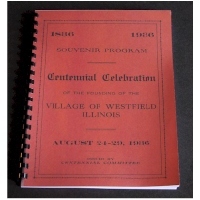 Souvenir Program Centennial Celebration of the Founding of the Village of Westfield Illinois, The Centennial Committee, 1936, 40 pp, This book contains, history, a few photos, ads of the local businesses and politicians, and program of daily events.